"Join Link and Zelda in an all-new adventure! 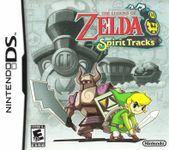 Spirit Tracks have long protected the kingdom from evil. When they start disappearing mysteriously, Link and Zelda must travel the land together to restore them and keep the dark forces at bay. Team up with a Phantom to work your way through dungeons together. Fight enemies, explore the world, and complete missions using the train! New items like the Whirlwind let you solve puzzles in new ways. Battle up to three other people using one Game Card!"